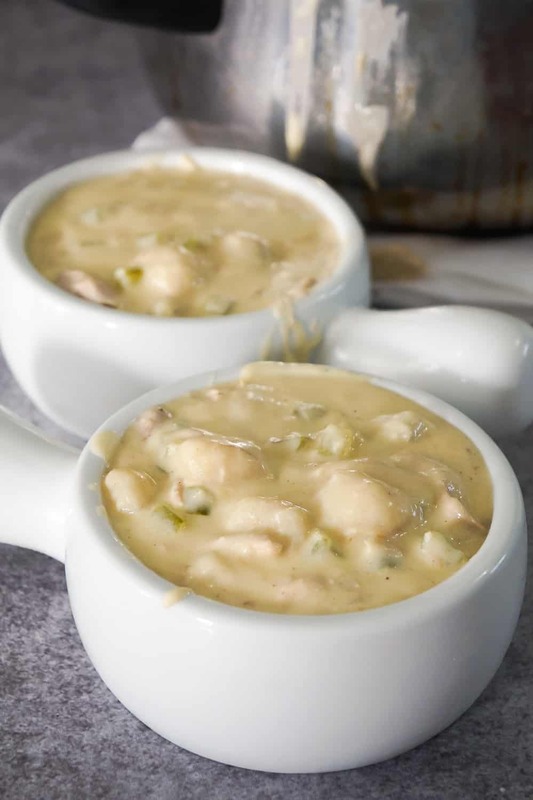 Instant Pot Chicken Gnocchi Soup with Cream Cheese is a hearty soup recipe perfect for weeknight dinners. 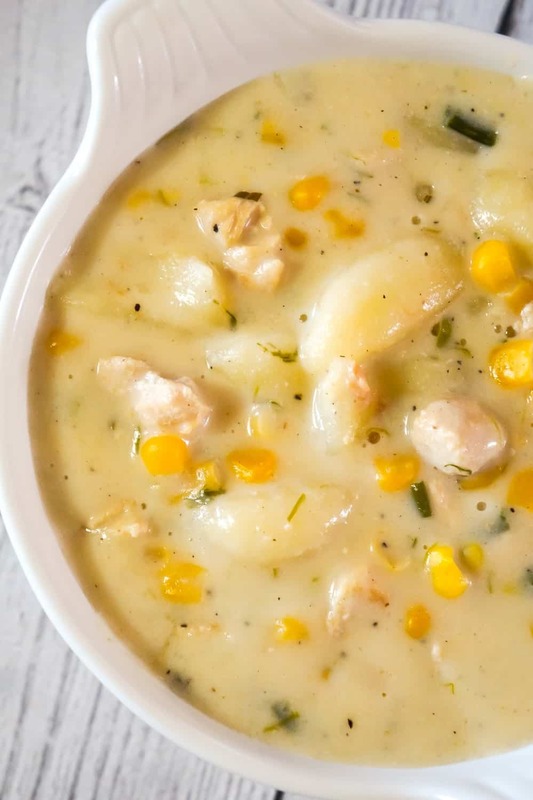 This creamy soup is loaded with potato gnocchi, chunks of chicken breast, corn and Philadelphia Whipped Chive cream cheese. To make this chicken gnocchi soup, I started by dicing some boneless, skinless chicken breasts into small chunks. 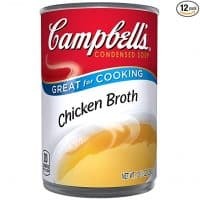 I added a dab of margarine to the pot and then dumped in the chicken breast chunks. I cooked the chicken breast pieces until almost no pink remained. Then I added some condensed chicken broth, water and store bought potato gnocchi to the pot. 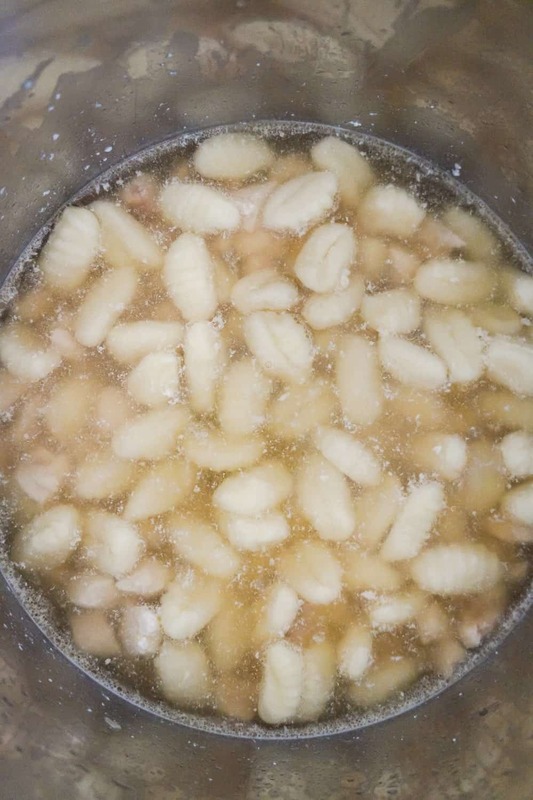 I gently pushed down the gnocchi until they were submerged in the liquid. 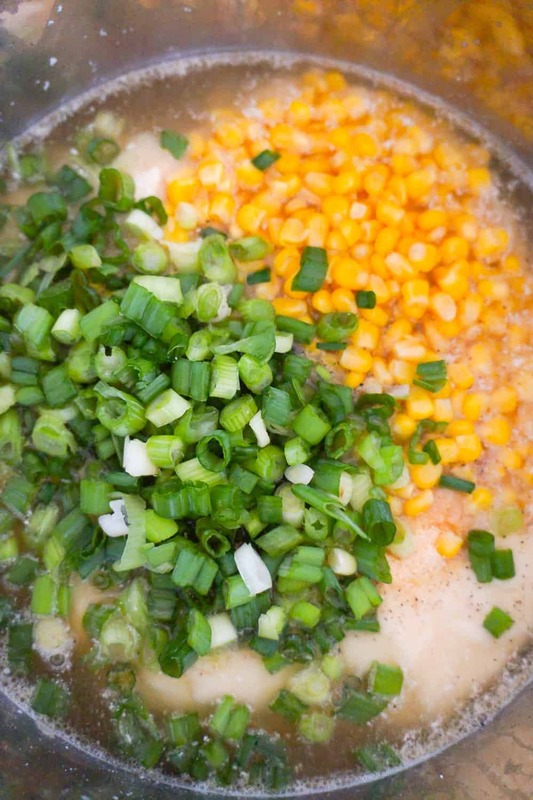 Then I added some cream of chicken soup, spices, canned corn and chopped green onions to the pot. I did not stir before placing the lid on the Instant Pot. Then I turned the steam release handle to the sealing position and set the Instant Pot to Pressure Cook High for three minutes. When the Instant Pot was done cooking I allowed it to natural release for 4 minutes before turning the steam release handle to the venting position and finishing with a quick release. 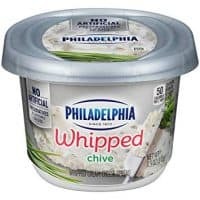 I added some Philadelphia Whipped Chive cream cheese to the Instant Pot and stirred well until it melted into the soup. 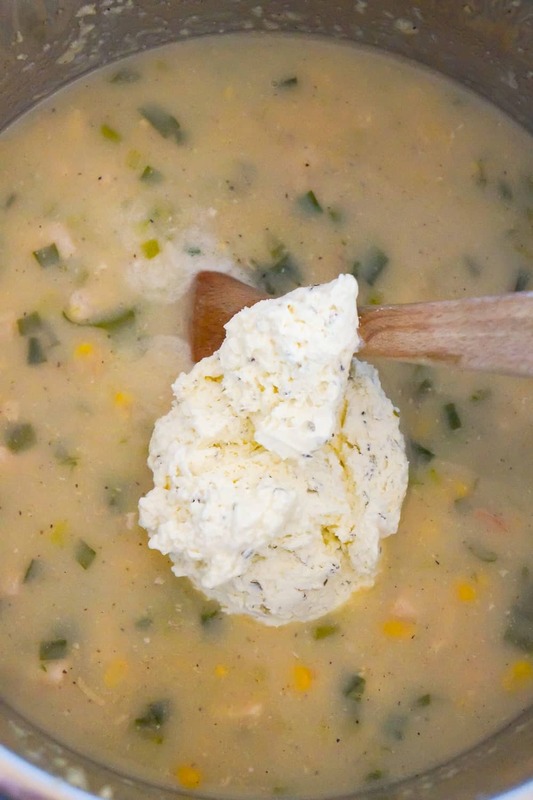 This easy chicken gnocchi soup is the perfect comfort food. 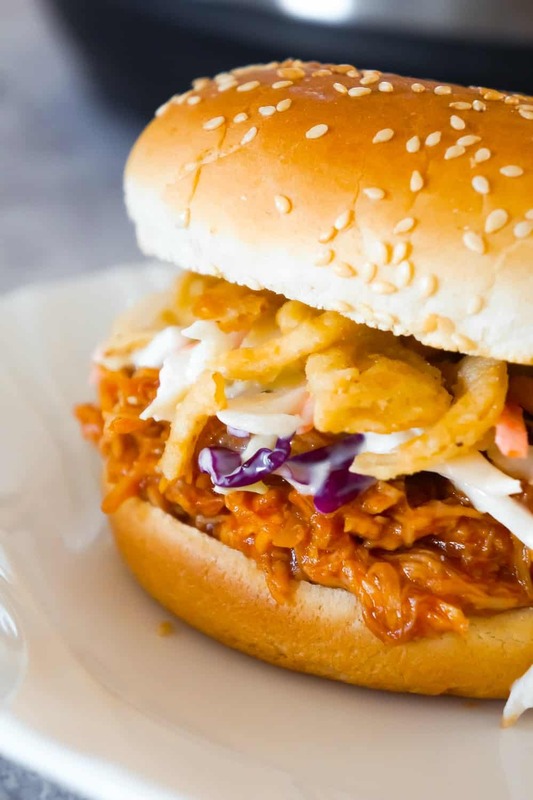 This recipe was tested in an 8 quart Instant Pot Duo and serves 4 people as a main course. 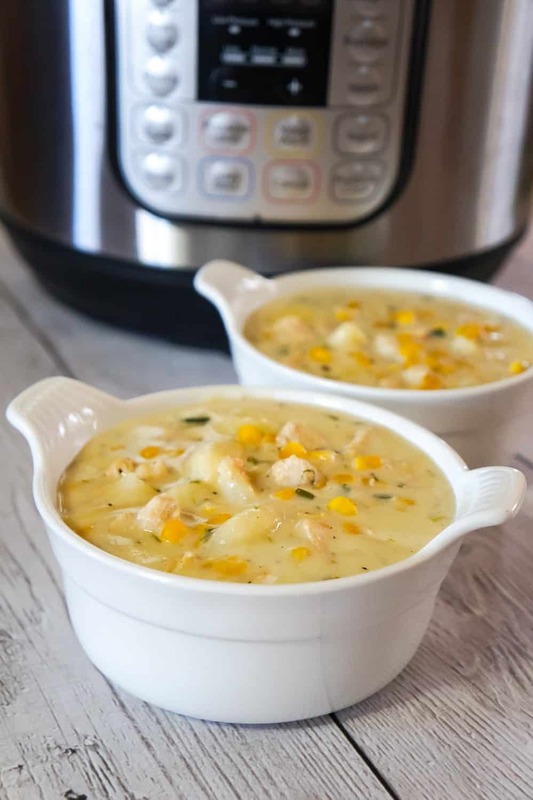 If you are looking for a delicious soup recipe for your Instant Pot then you need to try this Instant Pot Chicken Gnocchi Soup with Cream Cheese. Another tasty Instant Pot chicken recipe. 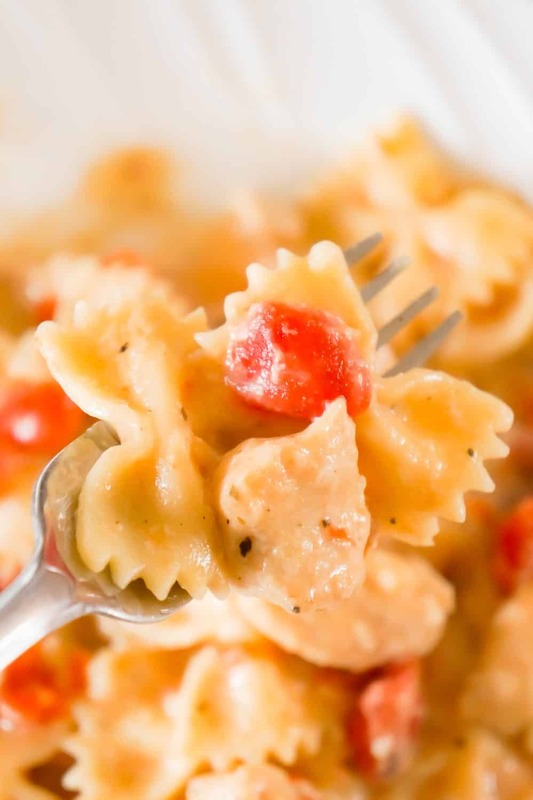 Check out this Instant Pot Bruschetta Chicken Pasta! 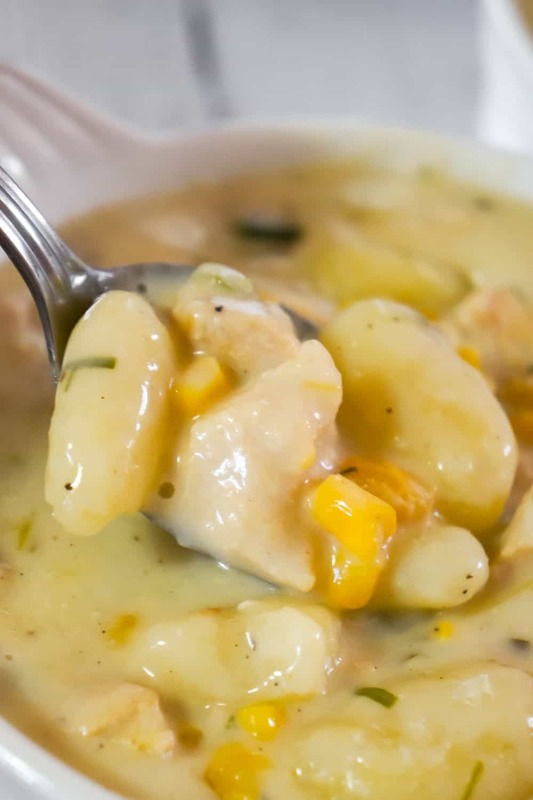 If you are looking for a stove top chicken gnocchi soup recipe then you need to check out this Easy Chicken Gnocchi Soup! 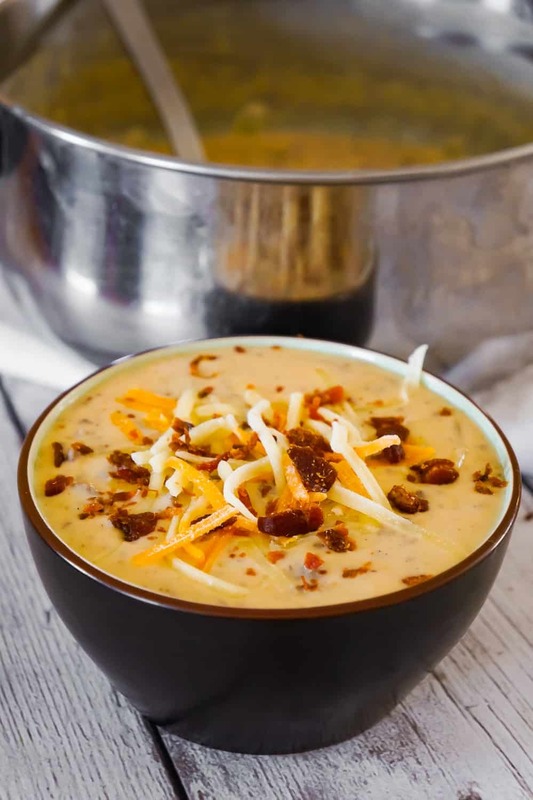 Be sure to also check out this Bacon Cheeseburger Soup! Instant Pot Chicken Gnocchi Soup with Cream Cheese is a hearty soup recipe perfect for weeknight dinners. 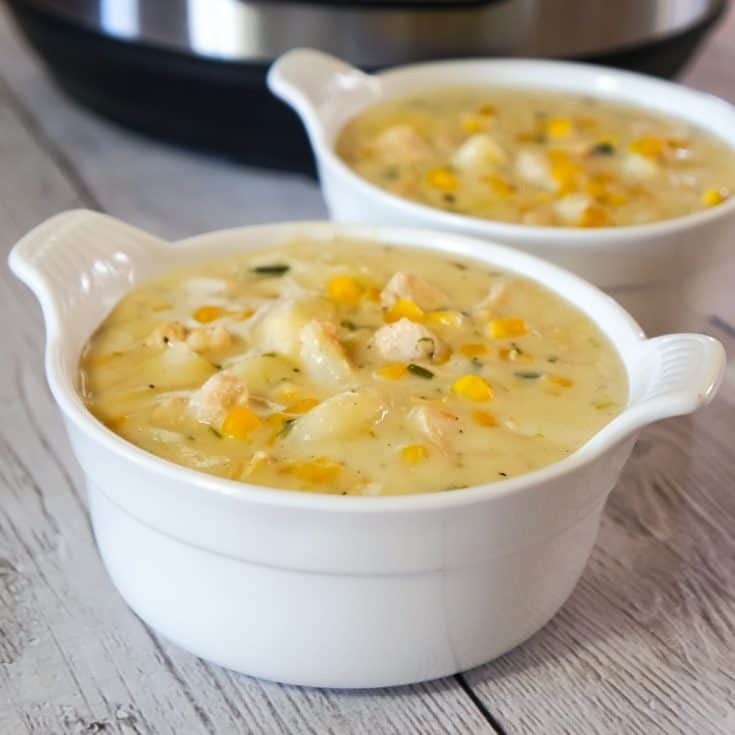 This creamy soup is loaded with potato gnocchi, chunks of chicken breast, corn and Philadelphia Whipped Chive cream cheese. 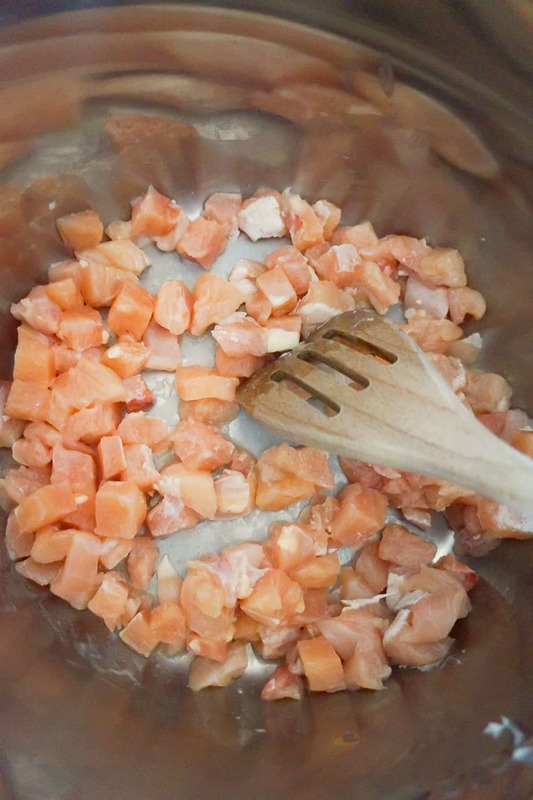 Chop chicken breast into small chunks. 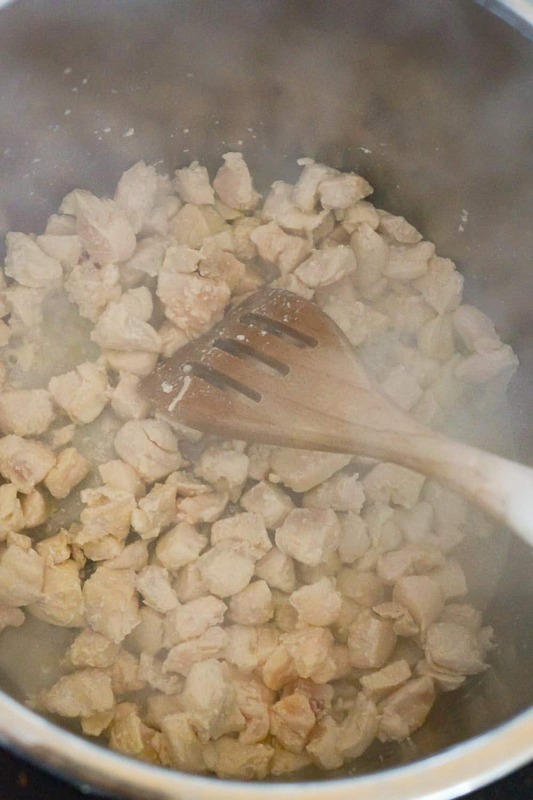 Add a dab of butter or margarine to the pot and then add the chicken breast chunks. 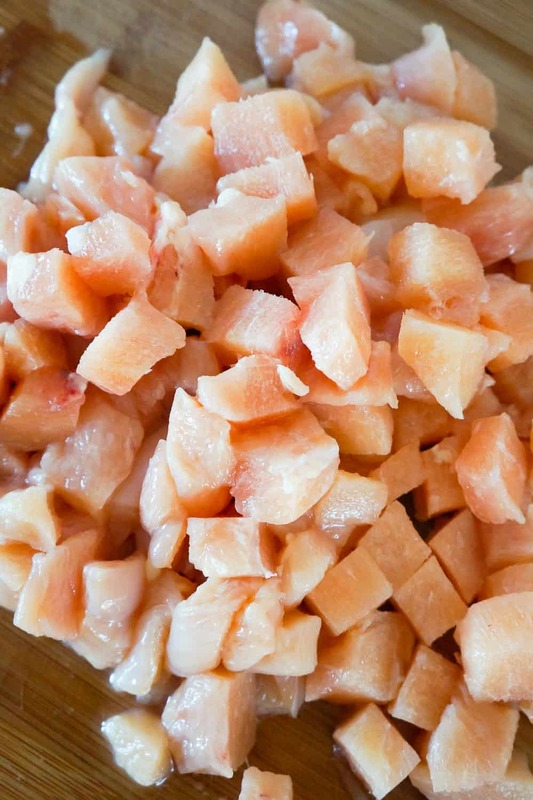 Cook the chicken breast pieces until almost no pink remains. Add the chicken broth, water and gnocchi to the pot. 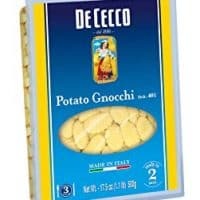 Gently push the gnocchi down until it is submerged in the liquid. 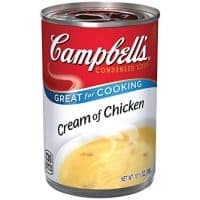 Add the cream of chicken soup, onion powder, garlic powder, pepper, salt, canned con and chopped green onions to the pot. Do not stir! Set the Instant Pot to Pressure Cook High for 3 minutes. When the Instant Pot is done cooking leave it to natural release for 4 minutes and then turn the steam release handle to the venting position and finish with a quick release. Add the cream cheese to pot and stir until it is melted into the soup.